Celebrities stripped to the bare essentials - seemingly a must-have for today’s crowd-pleasing magazines. So let me ride this passing bandwagon by introducing a soap-star habitually shedding fabric - a Coronation Street regular, witness to romance, thrills, mirth and murder. And that was just last night’s episode! 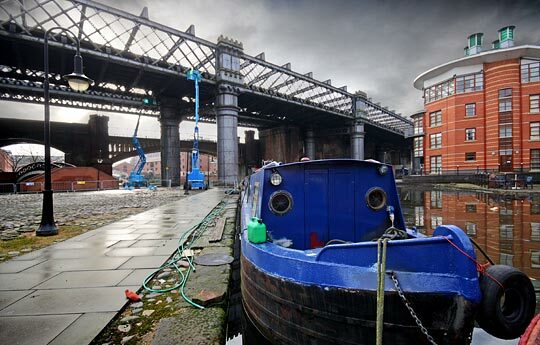 Britain’s first Urban Heritage Park encompasses a collection of industrial landmarks in Castlefield, close to Manchester city centre. The area has been a transport hub for almost 250 years - the Bridgewater and Rochdale canals meet here, as do the railways from Trafford Park and Ordsall Lane Junction. Metrolink soars over all of these. From two cherry pickers, corrosion is being removed from the viaduct. Whilst the 1969 closure of Manchester Central Station - now an exhibition venue - prompted tracks to be lifted, the infrastructure that carried them remains largely in place. 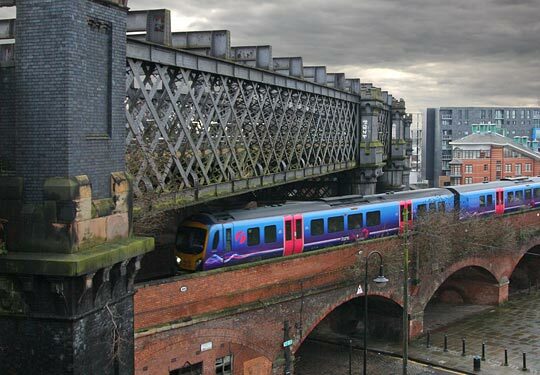 The two operational routes thread their way through Castlefield on low-level brick viaducts, with the line from Ordsall Lane itself bridged by two spans forming part of high-level structures. The southernmost of these, Cornbrook, was opened by the Cheshire Lines Committee (CLC) in 1877 and has accommodated Metrolink’s trams for the past 18 years. 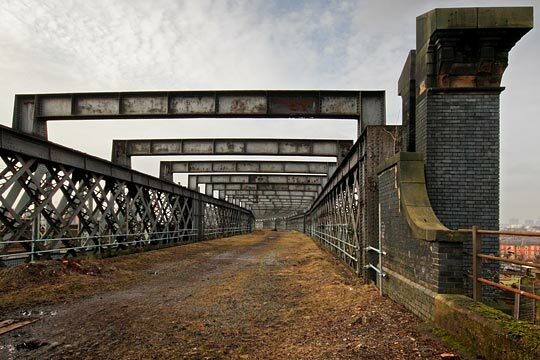 The younger but sicklier northern viaduct remains devoid of function except for its iconic role in the cityscape and frequent on-screen appearances. Corrie’s cast and crew are often found under it. Another colossus of the CLC, its three tracks served both Central Station and the adjacent Great Northern goods warehouse which prompted its construction in 1891-92. (Left) A span of Cornbrook Viaduct - now a conduit for Manchester Metrolink - acts as a backdrop to this shot. 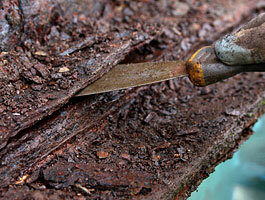 (Right) There is a huge amount of loose material to remove. Castlefield is one of three-dozen listed viaducts on the inventory of British Railways Board (Residuary) - its owner and maintainer. Predominantly wrought iron, it is a through lattice girder design of around 330m in length, comprising eight spans. Formed from segmental castings and founded at a depth of 6.1m, the piers’ diameter tapers from 4.6m at their base to 3.2m at ground level. They are concrete-filled and tied to their neighbour by a girder dealing with lateral forces. Behind decorative castellations, bearing plates support the heavy end posts of 16 trusses, the longest of which reaches 53m. Each pair is restrained by brace beams at 6.4m centres. Span 7 is acutely trapezoidal, allowing Span 8 to cross the Ordsall Lane line on a skew of around 65° - its southern truss benefits from an additional orphaned column. The bottom chord of each truss forms a channel which has become a corrosive water trap. It carries the transverse bearers which, in turn, hold the deck plates and ribs to which the running rails were fastened. The bottom chord of each truss is effectively a trough which is now full of water. Time and a lack of substantive maintenance have not been kind to the structure - a reality not helped by Manchester’s notorious weather. 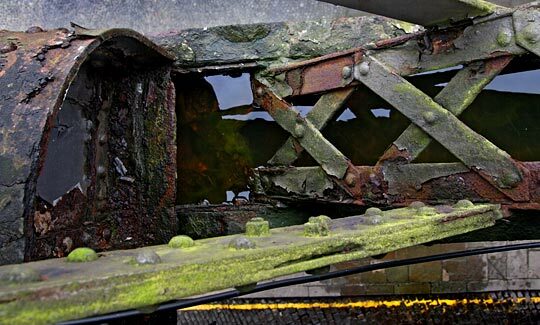 The Board’s annual inspection regime together with observations from external parties confirmed that loose corrosion product was falling from the structure. Beneath it are a cement batching yard, live construction site, highways, waterways, the Network Rail line and ‘public realm’ areas. Given the obvious risks, a project was established to make it safe for those working or passing below. With a significant number of affected landowners, the consultation, planning and approvals phase was always going to be a slog - and so it proved, lasting around 12 months. Balvac Ltd - in joint venture with fellow Balfour Beatty Group company Raynesway Construction Ltd, the Board’s northern framework contractor - was given a brief to determine how the structure could best be accessed to carry out the work. Jacobs provided technical support and performed an ecological survey, looking beneath the structure for bats and at the plant-life on its deck for any rare species. Thankfully there was neither. Whilst access is available, the company has an ongoing role during this phase of the works, scoping the requirements for future permanent waterproofing and durability repairs. The project's first stage involved the clearance of vegetation from the deck. October 2009 saw work start on site. The initial stage involved the removal of extensive, waist-high vegetation from the deck. That was relatively straightforward. Far more challenging has been the subsequent descaling work, ridding the viaduct of its loose material with hammers and scrapers. Access rights have been arranged to allow the use of either abseilers or cherry pickers. Whilst the latter has proved effective in tackling the piers and soffits, the height of the latticework has favoured the former. The abseil operation is self-contained, with collection bags and catch nets ensuring nothing falls to the ground. For the same reason, debris is collected in the netted hoist baskets before being lowered and disposed of. Where work is taking place overhead, areas have to be cordoned off although controlled through routes are established to maintain public access to the bars, businesses and bridges hereabouts. Progressing from west to east, the five spans of the first phase took three weeks to complete. But Phases 2 & 3 are logistically more complex, entailing work above Duke Street - which runs beneath the structure for a distance of 50m - and Castle Street. The expected timescale here is six weeks as working hours will be limited to periods when traffic management can be established. And then there is Phase 4 with its Network Rail interface. Only small windows of opportunity are open for Span 8 as it necessitates possession of the lines passing underneath. These are currently being negotiated but will only be available overnight Saturday-into-Sunday when no trains run. The project is likely to reach its conclusion in May. Saplings seem to secure a foothold almost anywhere. 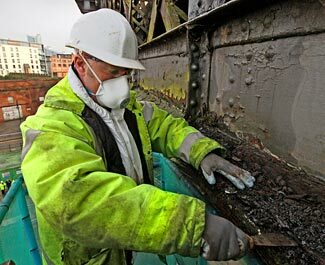 The attention being given to Castlefield Viaduct is revealing much about its varied condition. The southern side benefits from shelter afforded by the adjacent Metrolink structure but exposure has taken its toll on the northern side, compromising the paintwork - which seems to have been brush-applied in a single coat - and causing considerable corrosion. 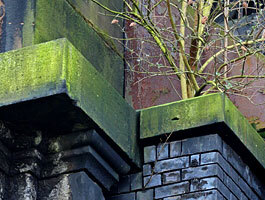 Vegetation continues to secure a foothold on the underside of the structure where much of the ironwork never gets the opportunity to dry. This is compounded by failed waterproofing and blockages within the drainage system. Clearing debris from the trusses’ bottom chord, thereby allowing them to drain, is a priority for Martin Dils, one of the Board’s civil engineer. 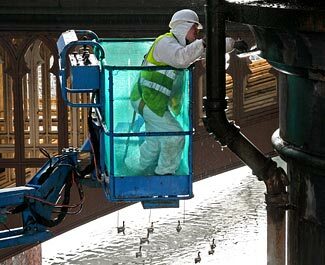 Although a major refurbishment of the viaduct will strain BRB(R)’s limited finances, this is seen as the most sustainable approach, safeguarding it long-term. Subject to funding, plans are being developed for this to happen in 2012/13, involving a waterproofing exercise and miscellaneous repairs to restore some durability. Jeff Pierce, Balvac’s project manager, is in no doubt about the extent of the planning challenges presented by that work, requiring the structure to be completely encapsulated. The ongoing project, providing a short-term fix, has renewed interest in the viaduct amongst those who live and work locally. Residents and the city council receive regular updates on how the works are progressing - for both, halting the decline of this Grade II listed giant clearly matters. Like many of those featured in our glossy mags, Castlefield Viaduct plays a largely superficial part. It will though never shoulder the transient burden of celebritydom. When the wannabees have returned to obscurity, it will still boast The X Factor. The viaduct's easternmost span under which is threaded the operational line between Ordsall Lane Junction and Castlefield Junction. Historical overview of the viaduct. The history of Castlefield's canals and railways.